Elon University was founded near Burlington in 1889 by the Christian Church (later part of the United Church of Christ). Two denominational junior colleges were forerunners of Elon: Graham Normal College in Graham and the Suffolk Collegiate Institute, established in 1872 in Suffolk, Va. In 1882 the Southern Christian Conference adopted a resolution committing the church to establish a college. Six years later the provisional board of the proposed college accepted an offer of 50 acres of land at Mill Point, a freight loading station on the North Carolina Railroad (later the Norfolk Southern) five miles west of Burlington. The school was named Elon, the Hebrew word for oak, because the site was covered with a variety of massive oaks. Three students were graduated at the first commencement exercises on 2 June 1891. In order to raise funds for the school, streets were laid out around the site and commercial and residential lots were sold. The community was incorporated in 1893 as the town of Elon College. On 18 June 1923 a fire destroyed the school's main building, which housed the library, classrooms, the chapel, and faculty and administrative offices. Construction of five new buildings-three classroom and office buildings, a library, and an auditorium-began the same year. These five buildings remain at the heart of the central campus. Elon began offering graduate degrees (in business administration and education) in the 1980s, and by the early 2000s it was the third-largest private school in North Carolina. Elon is one of two private colleges in the state selected to offer the North Carolina Teaching Fellows Program. Enrollment totals about 5,000, including 250 graduate students. 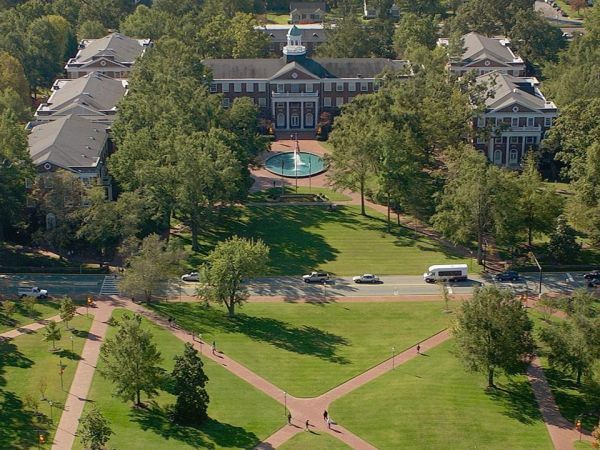 In 2000 the Elon board of trustees approved a name change from Elon College to Elon University, marking the institution's successful growth into a comprehensive undergraduate university. Durward T. Stokes, Elon College: Its History and Traditions (1982).